There are a lot of kinds of media you can use in your aquarium to create the most hospitable environment for the fish and plants that call it home. Choosing the right kind of media can be a little confusing because there are so many different options out there. If you’re looking for the best available aquarium filter media, here’s everything you need to know as well as reviews of our top six picks. 1. How to layer aquarium filter media? 2. How often to clean aquarium filter media? 3. How often should I replace aquarium filter media? 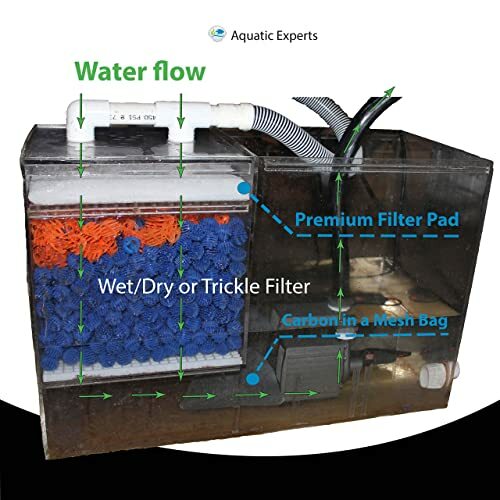 There are multiple ways to set up an aquarium filter to get the best results. That said, the most effective filtration systems use three different kinds of media. This is usually the first phase that the water passes through because it removes large, visible pieces of debris. This can be everything from uneaten food to detritus to pieces of leaves. Mechanical media can be dense mesh or even ceramic rings that form a barrier in your filter. Basically, it’s material that allows water to flow through while keeping the debris from recirculating into your tank. Chemical media removes the things from your tank that you can’t see, like ammonia. There are several different kinds of chemical media but the most common are activated carbon and zeolite. While you don’t actually place beneficial bacteria into a filter, you do need to provide it with a place to grow. Usually, this is accomplished through introducing biorings. Ceramic rings work, too. Beneficial bacteria should grow naturally and love places that are porous with a lot of surface area. They thrive on the nitrate in the water and remove it to prevent any harmful effects to fish and plants. We know that finding the right supplies for an aquarium can be a little overwhelming. 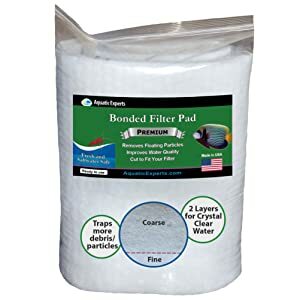 If you’re not sure where to start when looking for the best filter media for aquarium, we found a nice variety of products for you to consider. One of the first things you’ll notice about these filter pads from Aquatic Experts is how thick they are. They actually have two layers. The top layer has an open fiber that’s designed to trap large pieces of debris, like food, waste, pieces of decaying plant life, and detritus. The bottom layer is more dense to catch the fine particles that manage to make it through the first layer. What’s cool about this filter media is it comes in a roll. You customize it to the perfect size for your filter. It’s perfect for freshwater or saltwater and can be used in a variety of different systems. 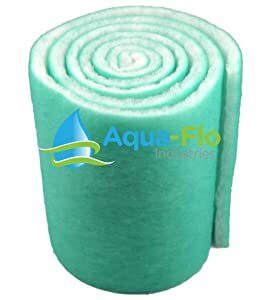 Aqua Flo has been making aquarium supplies for more than 30 years and this filter media has served a lot of happy customers. They don’t use any chemical in production which means it’s perfectly safe for all fresh and saltwater aquariums, tanks, or even ponds. This media has two layers, a coarse white layer to catch large particles and a finer green layer for the small things that sneak through. It’s more rigid than its competitors and exceptionally durable. Because it comes in a large roll, you can cut it to the perfect size for your filter. The roll is actually 12 x 6 feet so one roll will last a really long time. Activated carbon is especially effective as aquarium media. It works quickly, too, as much as twice as fast as other materials. This product from Marineland is specially sized to be as efficient as possible. It comes in small pebbles but if you find you want something smaller for your filter, all you have to do is run it through a coffee grinder and you’ll get a fine powder that’s just as effective. It filters out impurities that mechanical filters just can’t touch, leaving the water crystal clear and your fish as happy as can be. 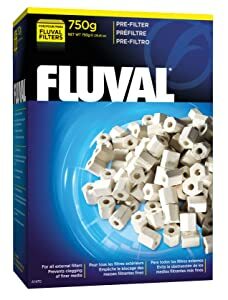 These Fluval ceramic rings work in two ways. First, the unique hexagonal shape creates a barrier that captures solid waste which will help keep your filter from clogging. Second, the ceramic surface provides a perfect environment for large populations of beneficial bacteria to grow which helps control ammonia and nitrite levels. Here’s the best part. They’re reusable. All you have to do is rinse them occasionally and you can keep putting them right back in the filter. 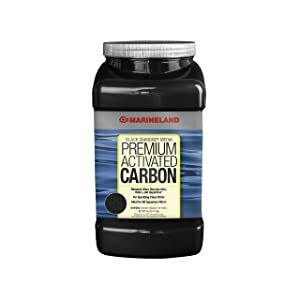 This blend from Marineland contains both zeolite and activated carbon. 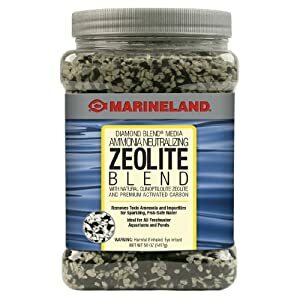 Zeolite is a white mineral that has an incredibly porous surface and is really effective at removing ammonia from aquarium water. 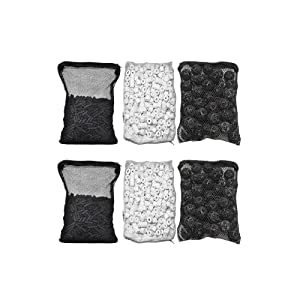 Activated charcoal also works to remove ammonia and chloramines along with other impurities. This media really is a double threat. It works fast and lasts a long time, providing clean, sparkling water for fish to thrive. Another option is this media kit from CNZ that comes with everything you need to get the water in your aquarium clean and chemically balanced. What kind of media are included? One of the materials it includes is activated carbon, which filters out ammonia and other invisible impurities. Bio balls are also included, which are 1 inch in diameter and the perfect environment for colonies of beneficial bacteria to grow. Lastly, it comes with ceramic rings, which act as mechanical filtration to trap larger pieces of debris as well as providing additional surface area for bacterial colonies to grow. This kit covers every kind of filtration you need for clear, sparkling water that will allow your fish and plant life to thrive. There is a science to layering the media in an aquarium filter but if you think about it, it makes complete sense. The first thing the water should filter through is mechanical media. This pulls out any large particles and debris and stops them before they reach the other layers in the filter. It also makes it easier for you to clean from the filter because everything should collect right on the surface. If you’re using something that is dual purpose, that should go next. Ceramic rings are a good example of a dual surface media because they catch large particles and provide a home for bacteria colonies to grow. They act as both mechanical and biological filtration which is why they’re referred to as “dual purpose”. Next up is the biological media. It’s important that this layer doesn’t get clogged. If the flow of water is stopped, that means the bacteria aren’t getting enough oxygen and the colonies will die off. If you placed the mechanical filtration first, this shouldn’t be a problem. The bottom layer should be the chemical media. It removes what toxins are left after the water passes through the biological filtration so it makes sense that it’s the last stage. If places before the biological media, there’s a risk that there won’t be enough impurities left for the bacteria to thrive. By placing it last, every layer of filtration can do its job most effectively. Maintaining the filter is the most important thing you can do to keep an aquarium healthy. If they aren’t working properly, toxic levels of ammonia and nitrate will quickly build up in the water, potentially killing the fish. Cleaning the filter media is essential to keep it working properly. A good rule of thumb is the more fish you have in an aquarium, the more frequently it will need cleaning. Larger tanks can go a little longer between cleanings but smaller tanks require frequent care. Test your water weekly using testing strips. These will tell you the ammonia, nitrate, and pH levels among other things. When you see a shift in the results, it’s time to clean your filter. Also, if you notice the flow rate slow down, it’s probably due to the filter media being blocked, which also means it’s time to clean. It’s hard to put a definite time frame on when to clean as it varies from tank to tank but, on average, once a month is a safe bet. Again, depending on the results of the strip test, you might have to do it more or less frequently. Mechanical media, bio balls, and ceramic rings should never be cleaned using tap water because the chlorine can damage it. The best way to clean these things is to fill up a bucket with tank water and rinse the media thoroughly in the bucket. That will prevent killing off any beneficial bacteria and keep potential contaminants from getting into the water. The easiest time to clean is when you’re doing a water change since you’ll already be taking water out of the tank. There are some exceptions because some media, like carbon, cannot be cleaned. Carbon filter media should be changed once every 3 weeks to make sure it keeps working properly. Carbon can’t be cleaned because the chemical properties that are required for filtration slowly degrade over time. It’s not as simple as giving it a good scrub. As for the other types of media, it depends. Mechanical media can be used until it basically falls apart. Since the job of this media is to filter out large pieces of debris, it will still work even if it’s not in perfect shape. Check your filter daily just to make sure it’s working smoothly. If you see any particles getting through that should have been stopped by the mechanical media, it’s time to swap it out for a new one. If you use bio balls or ceramic rings, you should only replace about ⅓ at a time and only if they are falling apart. Remember, colonies of beneficial bacteria grow on this media so replacing all of it at once will eliminate all the good colonies which will take a while to regrow. All of the filters we reviewed are great but it’s hard to choose the best one because they all work in different ways. If you’re just starting out and need something that will help you cover all your bases, start with the CNZ Aquarium Filter Media Kits. Because it comes with mechanical, biological, and chemical media, it provides you with everything you need to start a healthy aquarium.